Dallas Blogger Brunch had a fiesta at Taco Diner last weekend and it was delicious! Festive florals and mini piñatas decorated the table as guests enjoyed the new traditional brunch entrees at Taco Diner's Preston Center location. Over the last two years, Dallas Blogger Brunch has eaten at so many delicious Dallas restaurants, and this table setup is definitely one of my favorites! The amazing fiesta florals were done by Katie Bug Florals - founder Katie and I have a mutual friend and I'm so thankful that we recently connected on Instagram! We had so many compliments from other restaurant patrons about the florals during brunch and I am so happy that I was able to take one of the arrangements home to display in my dining room! I know I'll get questions about this, so I'll go ahead and tell you that the piñatas are from Amols.com, a party supplier based in San Antonio, and they were a great price too! I even had other people at Taco Diner ask me where they were from before, during, and after brunch - they were a big hit! Taco Diner in Preston Center is one of a few locations to be rolling out traditional brunch entrees, like my personal favorite: french toast! One surprising thing about their brunch entrees is that the portion size is actually close to what a real portion size should be, which I appreciate. The french toast came with a cinnamon cream topping that made it taste more like a sopapilla than normal french toast, and it was delicious. The cover photo at the top of this post is a photo of their Chilaquiles, served in the cutest skillet and so tasty! We also had some of their queso blanco with meat in it, and I literally couldn't take a photo because it was gone so fast! Queso blanco is my favorite kind of queso, so even if you go for brunch, I still recommend the queso! 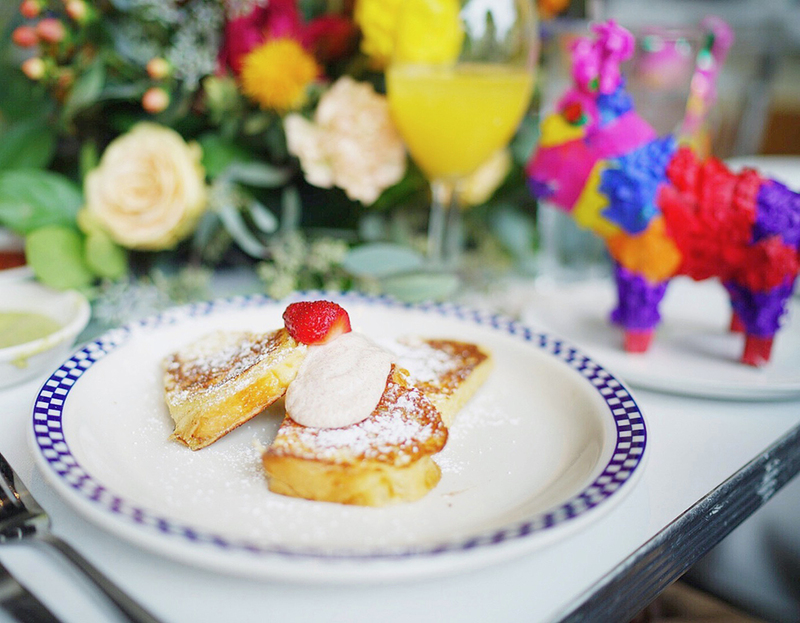 I love hosting Dallas Blogger Brunch each month and continuing to introduce bloggers to new friends and helping them get connected within the huge blogging community in Dallas! Thank you to Taco Diner for hosting our group this month- I'm sure I'll be back soon for more brunch (and queso! ).